I know that I told you in my article “Are Dog Beds Really Necessary?” that your dog spends most of his day either sleeping or otherwise lying around. And that’s very true. But the little guy does need to get out of the house every now and again for some exercise. And Let’s be honest here. So do you. Here are some good reasons to get your small dog out for a walk daily along with some tips for a successful walk. Both you and the dog need the physical and mental stimulation that a nice walk can provide. PetMD recommends that your dog participate in some structured physical activity for at least 30 minutes each day. The duration and pace of the walk will depend on your dog’s breed and age. Hunting, herding and working breeds will need longer and more intense exercise while breeds with short snouts such as bull dogs and pugs will be fine with a shorter, more leisurely stroll. Older dogs can also do with a little less exercise. Since many dogs are mixed breeds the best way to judge the length and duration of walks is to take clues directly from your dog. Pacing or restlessness is probably a good sign that your dog is in need of some outside exercise and stimulation. When you are out for a walk with your dog, there is a good chance you are going to run into other dog owners doing the same. This is a perfect opportunity for you and your dog to get to know your neighbors. The best way for your dog to socialize is to be around other dogs. 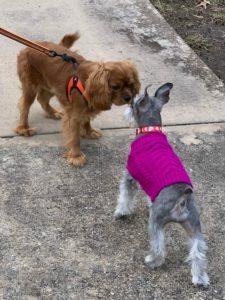 Of course, the earlier you start exposing your dog to other people, places and dogs, the easier and faster they will socialize but it’s never too late. Just keep her on a short leash, be confident and allow them time to get used to new people and dogs. If strangers want to pet your dog, be sure they keep their hands where your dog can see them. Petting them on their chest or head is best. 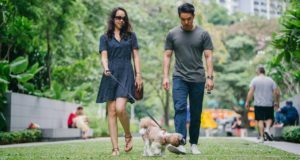 Getting out for a walk can do wonders for both you and your dog’s mental health. 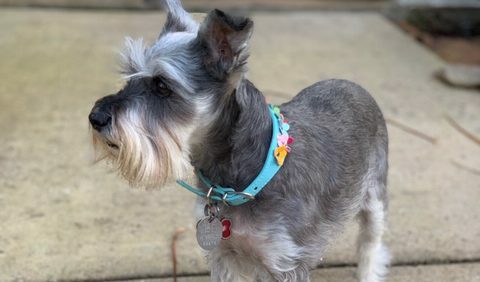 In the same way that being shut up inside can quickly become boring and leave you feeling anxious and restless, your dog gets tired of needs to get outside for the change in scenery and sensory stimulation. There is so much to enjoy on a walk. All the different sights for you, smells for your dog, the new sounds, people, sunshine, rain … all the things that make up the world outside are a mental and emotional treat for your dog and for you. Enjoy the time together and the world around you as you walk. Your dog enjoys being with you. Make the most of the time together and take the time to enjoy the experience. You will find that your attitude will make an amazing transformation. If your just beginning a daily regimen of walking you should first visit your vet (or at least give them a call). They can advise you on how much exercise is appropriate for your dog based on its age and breed type. You want to be sure they are getting enough stimulation but not so much exercise that more harm that good is done. There are a couple of keys to having an enjoyable walk with your dog. One is training. Take the time to leash train your dog. It’s so much more enjoyable for you both if your dog understands how to behave when on a leash. But if they’re especially stubborn (my cocker spaniel was that way) and insist on pulling on the leash then a harness which discourages pulling will make the walk more pleasant for you and eventually for your fur baby too. (once they learn that pulling results in an unexpected result for them. If you want to try to train them yourself here is a resource you will find useful. Walking with your dog each day is not only good for you and your dog physically, it is also good stimulation for you both mentally and emotionally. It allows you to not only meet the neighbors, but to get out and enjoy the great outdoors. For your dog it provides the exercise they need, but it gives them the mental and sensory stimulation that is essential to their well being and allows a great bonding experience for you both. Simply being in the back yard is not enough. Your dog quickly becomes bored, just as you would if playing in the back yard were your only choice. Put on your sneakers, grab the leash, get out there and enjoy! ← How To Keep A Dog Calm During Fireworks.